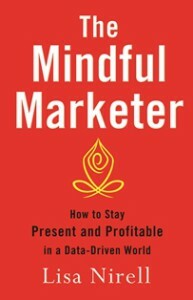 I am pleased to announce that my new marketing leadership development book, The Mindful Marketer: How to Stay Present and Profitable in a Data-Driven World is now officially available for pre-order worldwide. Since you are a member of our community, you can now download a complimentary sample chapter. This chapter outlines proven strategies to deepen your relationship with your CFO. My latest book responds to the rise of some recent, troubling trends for marketing leaders: big data, ROI pressures, and 24 x 7 customer demands. The Mindful Marketer shows that the pendulum towards technology over-stimulation has swung too far—and it’s time to make important decisions without depending solely on data. My supporters and endorsers include Guy Kawasaki, Chris Brogan, sales guru and bestselling author Jill Konrath, Marshall Goldsmith, Shama Hyder, former Kodak CMO Jeff Hayzlett, and Airbnb’s Chip Conley. Enjoy this sample chapter, and let me know what you think. P.S. If you would like an autographed copy of The Mindful Marketer, come celebrate with us on September 10 in Washington, DC. I’ll be the featured expert at the DC Advertising Week luncheon. Bozzuto’s CMO, Jamie Gorski, will be leading a fireside chat and providing complimentary books for attendees.